Fantastic Five, dubbed the Milleniums Greatest Comic Magazine, tells the continuing story of the Fantastic Four family within the MC2 Concept universe. The series was one of two that launched the second year of the MC2 Concept, alongside the Wild Thing series. This series replaced the A-Next comic-series. It however lasted for only 5 issues. 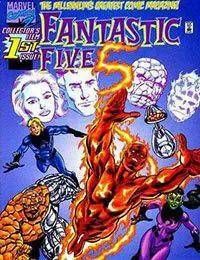 The series was followed by a second volume limited series also titled Fantastic Five.